What is a depreciation schedule and why do I need one? Are you thinking about investing in property this year? One of the reasons why investing in property helps you to build wealth is that it offers you various tax deductions. But many first time investors are unaware of all the tax deductions that may be available. One of the tax deductions you can claim on your investment property that is frequently overlooked, particularly by first time investors, is depreciation. For this you need to organise a depreciation schedule when you purchase the property, so you can start claiming the tax break as soon as possible. In this article we explain what a depreciation schedule is and how to obtain one. Depreciation occurs as an item’s worth becomes less over time as it is used and it wears out. When you’re talking about a tax deduction, depreciation is a method of allocating the cost of an item over its useful life. For example, if your property has an oven that is valued at $1,000 and has a ten year life, you can claim $100 against your taxable income for 10 years on that individual item. Depreciation on plant & equipment: this refers to items within the building like ovens, hot water heaters, air conditioners, carpets, blinds and so on. Depreciation on buildings or ‘building allowance’: this refers to the construction costs of the building itself, such as concrete and brickwork. In order to make a tax claim for depreciation, you need a report that identifies all the things that may be claimed against your tax and the current value of each item. The report must separate all the different items into the two categories mentioned above, and each item depreciates at a different rate. Each property will be different from the next and will contain a wide variety of different items that fall into these categories. The amount of tax benefit you receive will depend entirely on the property you purchase. Many experienced property investors will deliberately choose properties that will give them the most depreciation benefits. When should I get a depreciation schedule? You should create a depreciation schedule as soon as possible after settlement, preferably before tenants move in. This will allow you to maximise your tax benefits and will help you to avoid causing disruption to your tenants. If you didn’t get a depreciation schedule when you first purchased your investment property, you can still get one now and start claiming your deductions moving forward. How do I create a depreciation schedule? When you purchase a property, all the assets within the property are not itemised by value. What’s more, the government will not take your word for the value of the items. That means you can’t create a depreciation schedule yourself. In order to claim any tax deductions, you will need to employ a qualified Quantity Surveyor to do a thorough inspection to identify what can be claimed and to make valuations in order to create a depreciation schedule for you. This is the only way you can legitimately claim tax deductions for depreciation. If you purchase a brand new property, preparing a depreciation schedule is much easier as the value of the items can be easily determined. If you have an older property though, things become more complicated and that’s another reason why it is important to use a reliable professional. A Quantity Surveyor will prepare your depreciation schedule report with a view to maximising your financial position in relation to your property assets. And their fees are fully tax deductible. If you need help locating a professional Quantity Surveyor, then please give us a call and ask us for a referral. This article looked at just one way you could benefit financially from purchasing an investment property, but there are many reasons you may want to invest! If you’re thinking about getting into the investment property market this year, then give us a call. Welcome to our February newsletter! Now the school year has started and we’re all back at work, it’s time to get ready for a great year ahead in our property markets. It looks as though market conditions will be more favourable for buyers this year, and we’re excited about helping you make your next move in 2016! Last week, the Reserve Bank of Australia (RBA) met for its first meeting for 2016 and decided to keep the official cash rate on hold at 2.0%. According to RBA Governor Glenn Stevens in his statement after the meeting, the RBA Board is waiting for more economic data to come in before deciding if further cuts to the cash rate are necessary. The RBA cut the official cash rate in February and May last year, bringing it to historical lows. However many economists and market analysts are predicting that another cut is on the horizon in 2016 and is most likely to occur mid-year. As expected, property markets around the country have not been seeing much activity during January. Summer is traditionally a slower time of year for property sales and this has been reflected in low auction numbers, with only 336 auctions reported nationwide for the final week of January. After a very fast and furious year in 2015, NSW only saw 59 auctions in the last week of January, with a clearance rate of just 45%. It is interesting to note that 22 of these properties were passed in, indicating that sellers may be struggling to achieve their expected price. Victoria held 151 auctions with a clearance rate of 71%, Queensland held 60 auctions with a clearance rate of 50%, South Australia held 97 auctions with a clearance rate of 68%, Western Australia just 29 auctions with a clearance rate of 56%, Canberra had 27 auctions with a clearance rate of 78% and Tasmania held 12 auctions with a clearance rate of 13%. Clearance rates are significantly lower than we were seeing last year, indicating that the rapid rises in home values we saw in 2015 are slowing considerably, which is good news for first home buyers. During January, Sydney’s home values only increased by 0.51%. However they are still up by 10.52% compared to this time last year. By contrast, Melbourne’s home value growth is still strong, showing a 2.47% increase in January and a 10.97% increase over this time last year. Other property markets showing a strong performance in January were Hobart, with a rise in home values of 4.67% last month, and Canberra with a 2.76% rise. All other cities showed very marginal movements of less than one per cent. We can expect to see auction numbers rising again towards the end of February and a busy month in March. Real estate search sites are showing a good supply of housing stock with Domain currently listing over 363,300 properties on the market for sale nationwide. If you’re planning to purchase a property in 2016, whether you’re a first home buyer, next home buyer or a property investor, we look forward to talking with you about your plans. If you’re thinking about refinancing your home, now is also a very good time to talk with us, as the lenders are offering very competitive rates across the board and some interesting incentive deals. Whatever your plans for 2016, remember we’re here to support you and help you reach your goals, so please give us a call today! 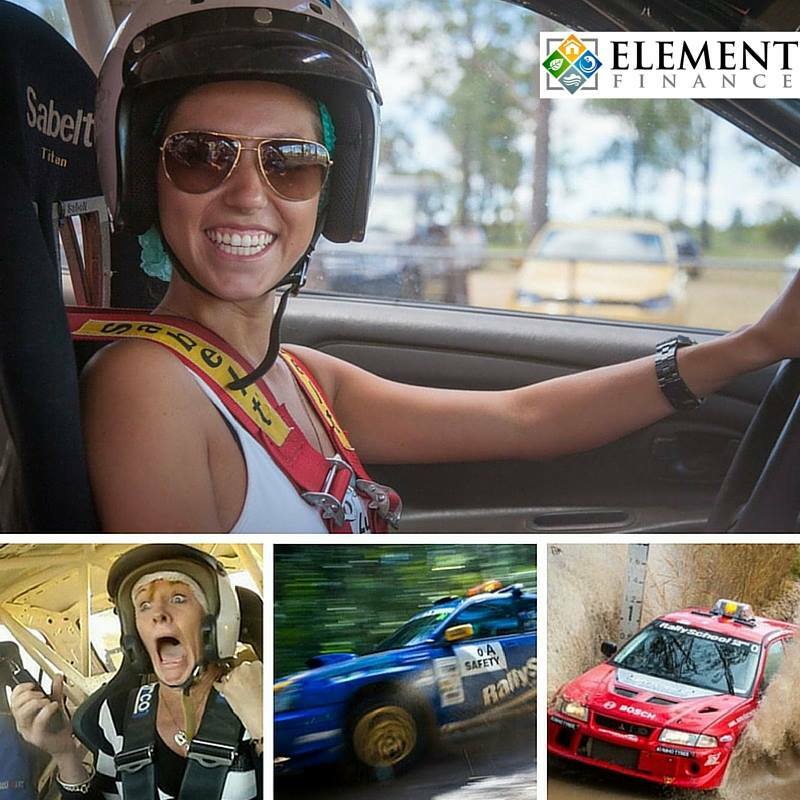 February’s adrenaline giveaway from Element Finance Fremantle! GIVEAWAY TIME! This one is a MASSIVE prize guys. Here is your opportunity to become RALLY CHAMP for a day. This is an awesome introduction to the adrenaline-fueled world of rally driving in real competition vehicles. Take your choice of rally car from a fleet of Australian Rally Championship spec super cars, including the Subaru WRX STi and the Mitsubishi Lancer Evo. You are given four rally driving sessions behind the controls of a minimum of two different cars over the rally driving dirt circuit layout, for a minimum of 28 laps of the ‘Rally Practice Stages’. You’ll be taught mind-blowing professional rally driving techniques which, in addition to getting the most out of these high-performance rally driving vehicles on the day, will also make your everyday driving safer and more enjoyable. Finally, to top off the rally driving course, you’ll be strapped into the co-driver’s seat and taken for a humbling rally hot lap blast by one of our professional rally drivers, and these guys don’t hold back! 2. Visit the Element Finance page and comment on this image with the name of the person you think makes the best (or worst) co-driver/navigator on road-trips. Moving up – could an apartment be your first home? Are you in the market for your first home? Perhaps you’ve been dreaming the classic home buyer’s dream of a little house with a garden and a white picket fence? If this sounds like you, then you may have found that your property searches in 2015 were unrewarding – with the property market running hot and stiff competition for every opportunity. Could it be time to revise your vision and start thinking about buying an apartment instead? A higher level of availability could make a trendy little apartment a great first step onto the property ladder! Whilst it may not be your first choice of property, an apartment could be a good way to get started and it could prove to be much more affordable for many first home buyers in 2016. Depending on the size and location, apartments do tend to be less expensive than houses and this often means they make better entry level properties. Because they cost less, you will require a smaller deposit to get onto the property ladder. In the case of a new build apartment, you may be able to purchase off the plan and this could potentially save you money on stamp duty as well. Generally speaking, maintenance costs are usually less on an apartment than on a house, simply because there is less to maintain. This can be a distinct advantage when buying your first home on a tight budget. This is particularly true if you buy a newly built apartment where all of the appliances, fixtures and fittings are brand new. Additionally, many analysts believe that there may potentially be an oversupply of newly built apartments in many capital cities both now and over the next two years. This may have the effect of keeping prices down, making apartment and unit properties even more affordable. A constant supply of new apartments may also restrict price growth on older, more established apartments. This may give you the opportunity to get a bargain buy and add value by renovating. Location. If you want to make sure that your apartment will appreciate in value whilst you own it, you should try to buy one in a location that will be popular with everyone and not just yourself. Look for a location that is close to public transport, cafes, restaurants, shopping and lifestyle amenities. Before you consider buying a property in an outer suburb or a rural location, have a chat with us about the potential for rental and capital growth. An inner city or suburban location is usually more popular with first home buyers, but if you find an opportunity you can afford in an outer lying area, it is a good idea to do some careful research to help you make a wise decision. Boutique. It is often true that apartments in smaller, boutique developments tend to be more attractive to renters than really large apartment block developments. Unless the apartment is really great – with an excellent facilities, location and local amenities, you may like to choose an apartment in a smaller development if you can. Of course, budget is a major factor but if you have the choice, go for a smaller apartment in a boutique development over a larger apartment in a really big block. Parking. Off-street parking can be very important to some property buyers, so try to buy an apartment that comes with its own designated parking space if you can. If you can get one with a lock-up garage as well, then that’s even better! If you find an apartment you like that doesn’t have parking, carefully consider the availability of parking in the area and nearby the block. Size. Apartments come in all shapes and sizes, but many first home buyers will be looking at one-bedroom apartments. If this is the case, look for one that is larger than 50sqm internally as some lenders may not want to finance an apartment that is smaller than this. If your budget will stretch to a two-bedroom apartment, then go for it. You may be able to rent out the extra space to help pay off your home loan – which could be a bonus. Easy lift access. Apartment buildings that do not have a lift and require you to walk upstairs to reach your apartment can be very inconvenient. New build apartments usually have lifts, but consider carefully before you buy an upper floor apartment that doesn’t have one! Balcony. People like to be able to get outside when they’re at home, so look for an apartment with a balcony or private outside area if you can. Even a small outside area will make your apartment more attractive to potential buyers down the track and this may have a positive effect on your resale value. Views. Apartments with nice views, or at least a sunny outlook tend to be the better buy. If you are buying off the plan, take particular care to consider what the outlook will be. If there are plans to build another apartment block right next door, you may find yourself with limited sunlight or a view of your neighbour’s bathroom if you’re not careful. As with any property purchase, it is really important to do your research before you put down your deposit. Try to find out if there are a lot of new apartment developments planned nearby in the future as this will affect the value of the apartment and may limit capital growth. If you are buying off the plan, it is particularly important that you get a professional independent valuation on what the value of the apartment will be when it is finished. Before you put down your deposit on any property – particularly if you will be buying off the plan, please talk to us about the financing to make sure it will be possible to arrange the amount you need to complete the purchase. Remember, having 10% of the purchase price for a deposit does not necessarily mean that a lender will automatically let you borrow the rest! We’re here to help you work out your financial position and get pre-approval on your loan so that you can search for your first home with confidence. Even if you’re some time away from having your deposit ready, it could pay to chat with us about your plans – we may even be able to help you get there sooner. Please get in touch on the details below.